Note from shop owner We will not be producing 2019 calendars. Stay tuned for 2020 designs and more colorful goodies! May 2019 be your best year yet! We will not be producing 2019 calendars. Stay tuned for 2020 designs and more colorful goodies! May 2019 be your best year yet! Speedy delivery!! 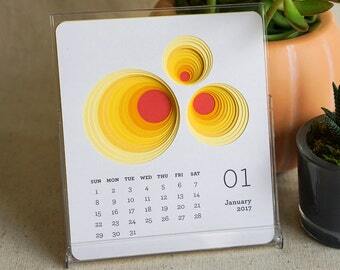 Love this compact calendar. Lots of colorful specialty cut desktop 2017 calendars to choose from! A photo of our little table at a recent holiday pop-up show! It all began with a light bulb moment. Hi, my name is Natalia, the designer and brains behind Yozhik&Co. One day I woke up with the want to shake things up and an idea to create a calendar. At the time, I had a cutting machine that was sitting in a corner eating dust for over a year, and thought … what ifffff …? 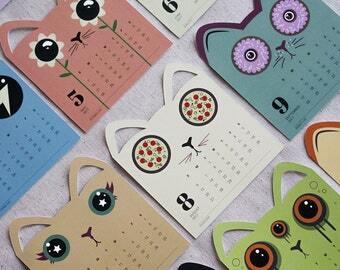 That’s how the die-cut calendars were born. I love minimalistic, clean design and all things cute. Yozhik means hedgehog (one of my obsessions). With this brand I hope to create many quirky and fun designs. This is just the beginning! I will be adding new die-cut calendars, greeting cards, and other paper goods in the weeks to come. Please follow on Etsy for new arrivals and other goodies! Like on Facebook and follow on Instagram for behind the scene shots of what’s brewing and for any future insider sales. To those that purchase these pieces, thank you thank you thank you! It means the world to be able to create and know that someone out there likes and appreciates the work! If you wish to include a gift note with your order, please include the message in the "Message to Seller" during check out. Pricing information on orders marked as gifts will not be included in the delivered package. Custom orders are accepted. Please contact Natalia with the details (size, quantity, etc.) for a quote. All custom work is limited to the maximum size of 6" x8.5" (flat, unfolded). Please contact Natalia for wholesale orders. Due to the complexity of the die-cut pieces, there is a 1-3 business day processing time, depending on quantity purchased and stock inventory.